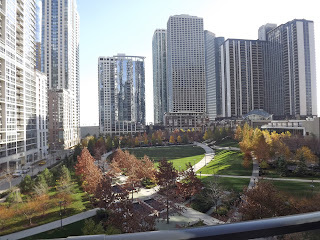 My stay at the brand new Radisson Blu Aqua in Chicago continued with a full tour of the property and a chance to experience two Michelin Star restaurants in one day. The day started with a healthy fruit-filled breakfast in the Radisson Blu business center. The behind the scenes tour took us everywhere through this building, designed by Jim Hamilton down to the long, single piece fireplace and carpet that represents and aerial view of Chicago and sits in the lobby. 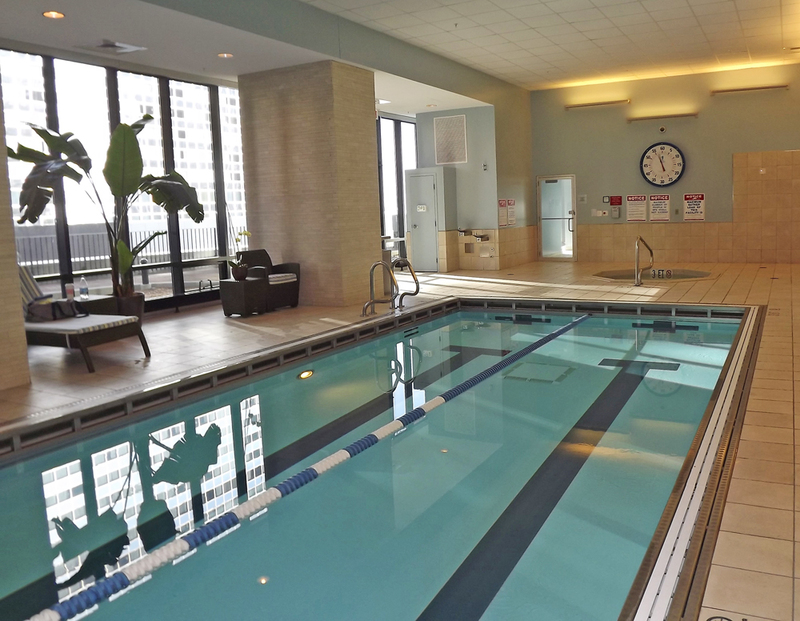 While the whole place is modern, warm and attractive, I was most impressed with the fitness facility. 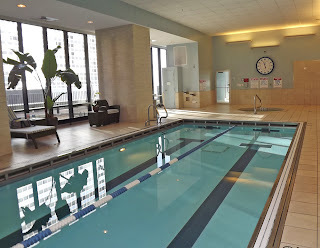 I have never seen anything like it at a hotel – 8,000 square feet of the latest exercise equipment; indoor and outdoor swimming pools; a spa area; an outdoor running track; and a basketball court. It fits in perfectly with the Magellan Complex neighborhood (also referred to as Lakeshore East), where a six acre park provides plenty of open space for walking. Meghan Risch of the Chicago Convention & Tourism Bureau came by again to give us another presentation on Chicago. Even though I’ve been living in Illinois for three years now, I don’t get into Chicago often (or stay long enough) so I really appreciate the information. I didn’t know, for example, that you can explore the cities attractions either free or cheaply by bus, trolley or water taxi. Or, that there are more James Beard winners at restaurants in Chicago than any other city in the country. It was a short while later that we were at the restaurant of one of those, Naha. Carrie Nahabedian is the award-winning chef at this restaurant and she has been a pioneer in the female chef movement in Chicago. Together with her cousin Michael Nahabedian she runs this Mediterranean influenced eatery, which holds a Michelin Star and focuses on the contemporary. The duo also prides themselves on working with many local farmers to bring sustainable ingredients in season. The wine selection at Naha is also unusual and I loved the Moschofilers, a Greek grape that is full of citrus, especially grapefruit. I started with a wonderful soup of Long Island Cheesecake Squash with crisp parsnip, mascarpone cheese and crushed pistachios. 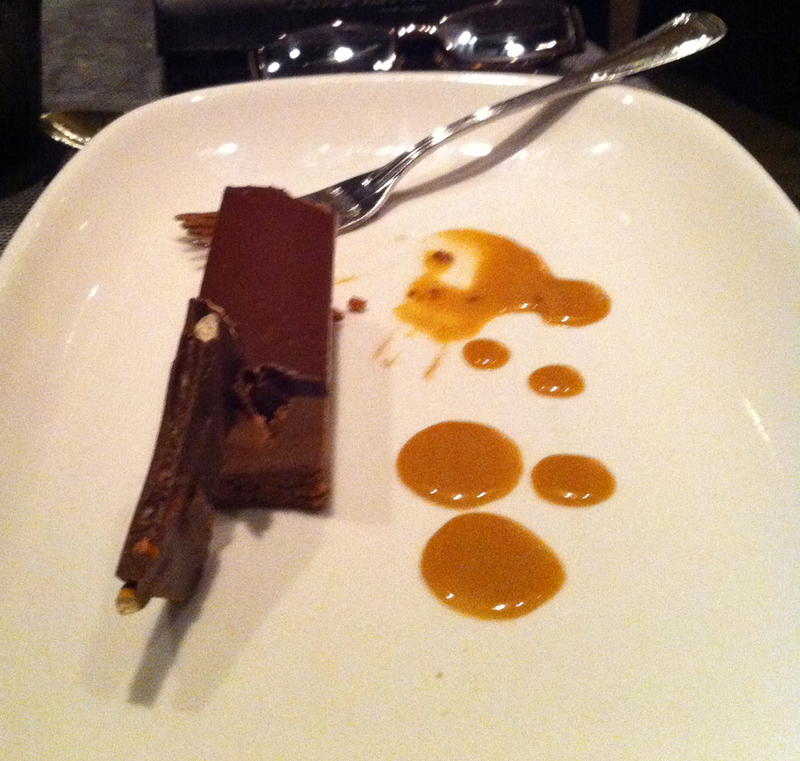 It was a good combination of slightly sweet and a bit salty. 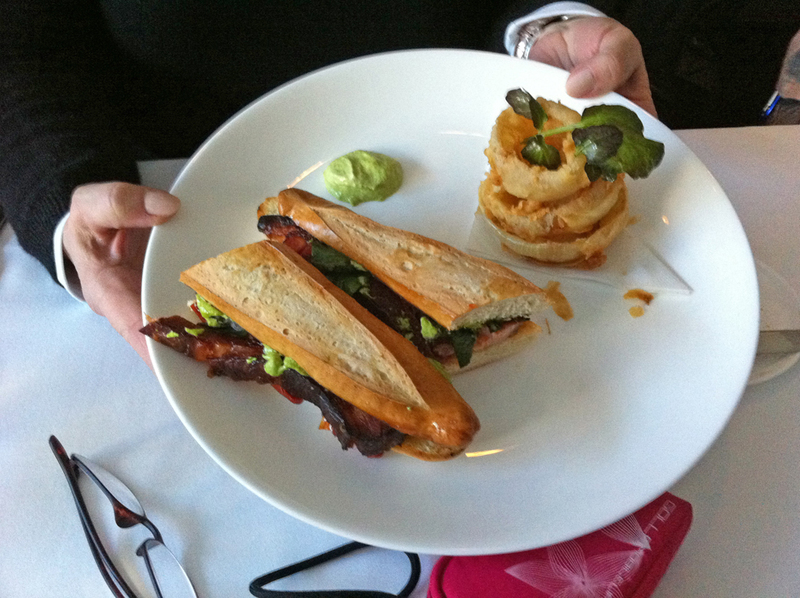 Many in our group ordered the signature Naha BLT with homemade thick bacon. I chose the Braised Pork Shank after being fascinated by its description – off the bone with 3 Sisters Garden white corn polenta and Roasted Brussel sprouts with golden chanterelles. It was as flavorful as it sounds and I was quite satisfied with my choice. The desserts were just as interesting, though I have to say I liked my choice the least (fortunately, we had a group the liked to pass things around for all to taste). It was a Bittersweet Chocolate Pave with a milk chocolate beignet and chocolate cream pinot noir ice cream and shaved French Autumn Perignord Truffles. 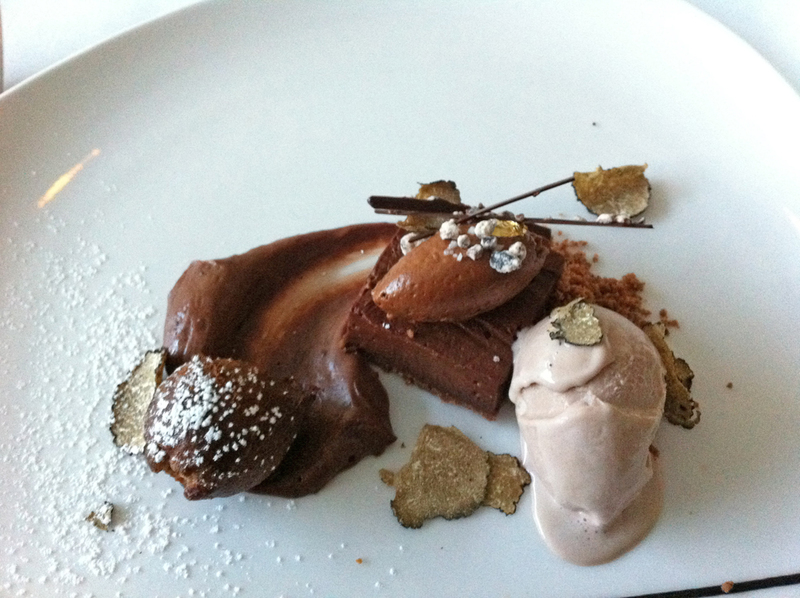 It was really excellent, except for the truffles, which I happily enjoy in everything – except ice cream. 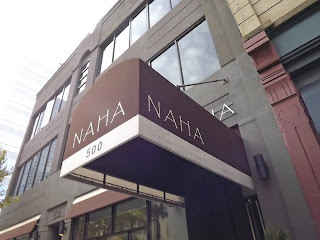 We had some free time to explore the hotel (which has a must-see art gallery) before we headed off to dinner at Sepia, which like Naha had received a renewal of their Michelin Star for 2011. We started off with cocktails and I was very pleased with the Sepia Mule, ginger infused Moon Mountain Organic Vodka with ginger beer. Our menu had been chosen for us, starting with a flavorful salad of salt roasted pear, hazelnuts, Tilston Point blue cheese and baby arugula in a white balsamic dressing. There were two choices for dinner. The first was a Pan Roasted Cod with butternut squash caponata and sage-walnut pesto which I was told was quite good. 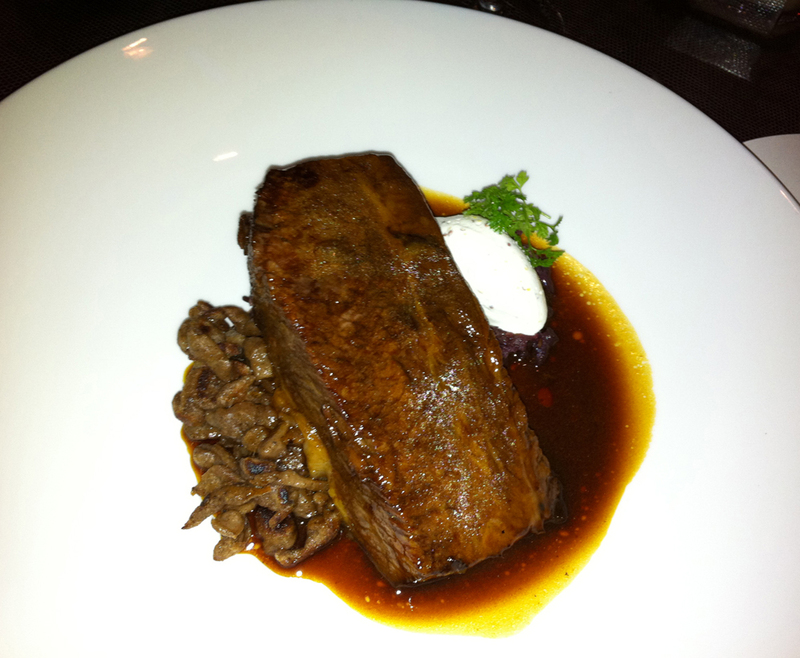 I had the Ale Braised Short Ribs with red cabbage and spaetzle in a mustard crème fraiche. The sauce was a bit rich, but I enjoyed the way the ale in the short ribs balanced the red cabbage and the spaetzle was cooked perfectly. A 2009 Diez-Caballero Tempranillo from Rioja was a bit buttery like chardonnay, but not suffering from a severe oaking. For dessert, a Malted Milk Chocolate Mousse on Peanut Butter Crunch satisfied everyone’s sweet tooth. Welcome to St Maarten, or is it Saint Martin?